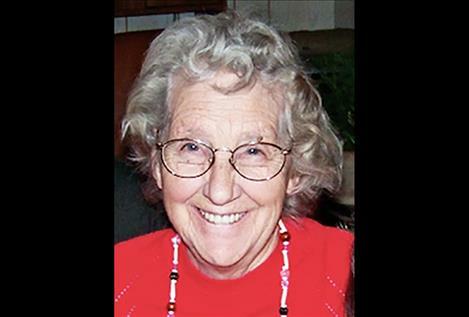 RONAN — June Irene Sanks was born in a small farm house near Hinsdale, Montana, on July 23, 1929, and passed away on Jan. 17, 2019. at St. Luke Long Term Care facility in Ronan. At the age of four, June’s family left eastern Montana and made their way to Sanders County and found a home on the western end of the “Eddy Flats” east of Thompson Falls. She rode the bus for twelve years to school and graduated from Thompson Falls High School in 1947. June committed her life to following Christ at an early age and He was the Foundation and Guiding Light of her life. She attended the Plains Church of God her entire adult life and served the church in several capacities during that time. She was on the church board, the church council, a long-time church treasurer, but teaching Sunday school brought her the most joy and fulfillment. June met Ernest Sanks at church and they were married in April 1953. Ernie and June raised two children at the family home west of Paradise. She enjoyed gardening and canning and kept the root cellar fully stocked with vegetables, fruits, jams, jellies, pickles, and even canned mincemeat for those wonderful mincemeat pies. June was preceded in death by her husband, Ernie, in 1996. She was also preceded in death by her parents, Edgar and Gladys Lacock, her sister, Goldie Lacock, and her brother, Roy Lacock, along with many uncles, aunts, and cousins. There was a time several years ago when June had 51 first cousins. She is survived by her children, Teena (Harvey), Gary (Lauralea), and stepson Wayne Hellström; her five grandchildren, Sam, Annetta, Steve, David, and Christina; her six great-grandchildren, Chelsey, Brad, Owen, Story, Eden, and Gideon. She is also survived by several cousins, nieces, nephews, and a great-niece that was special to her, Missy Lacock. There will be a celebration of June’s life on March 23 at 11a.m. at Harvest Community Church of God in Plains. The family suggests memorials to Harvest Community Church of God or the Gideon Organization. Memories and condolences may be sent to the family at: www.shriderthompson.com.